If you are the type of traveller who loves to explore even on holiday, have unique experiences, but still retain being laid back, then the Maldives is the best place for you to spend a holiday, or perhaps plan for a future Valentine’s getaway trip. All you need is to search this archipelago republic on the internet and be mesmerized by wonderful views, its sunrises and sunsets, the clear waters, amazing islands, pearly white beaches, and the wide variety of marine life thriving in the waters of the Indian Ocean. What we would usually advice is to either stay in a hotel, a resort, take an exclusive island tour, or get a liveaboard diving cruise (the latter two is readily available in package form at Adventure Maldives). You can still experience island hopping by yourself, sort of like backpacking, in order to experience the exclusive beaches, markets, and cafes along the way. However, the transportation service in the Maldives is not standardized nor government controlled. The ferry system implemented 6 years ago is still somewhat unreliable. 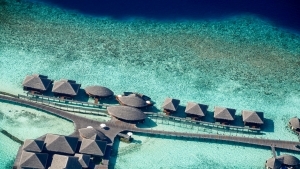 We would advice simply exploring Malé and its neighbouring beaches. You will experience a unique blend of Maldivian culture that is part Sinhalese, part Indian, and part African, and its people so friendly that you won’t be worried about the country being Muslim. The local delicacies are even more unique with tastes coming from Vietnam, Thailand, Sri Lanka, and India. For a small country the majority of its citizens is well educated and speaks passable to fluent English. Its people are well skilled for the tourism industry, coupled with great talent from its painters, artists, poets, musicians, and the like. When you do have your holiday in the Maldives, you will realize that all those aerial photos that you’ve seen on the internet will never do justice to the country’s real beauty. There’s something unique about looking out the airplane window and seeing all those little islands lined up in a perfectly blue and clear ocean, free of any pollution. The view will be so breathtaking it will have you reaching for your camera or phone. Here’s a bonus. When you land at the international airport it seems that you’re landing in the middle of the ocean since all you’ll see is the blue ocean on either side of the plane. And once you leave the plane, you’ll be surprised by the pleasant weather and clear smell, or the lack of any smell in the air, since the whole country is pollution-free.